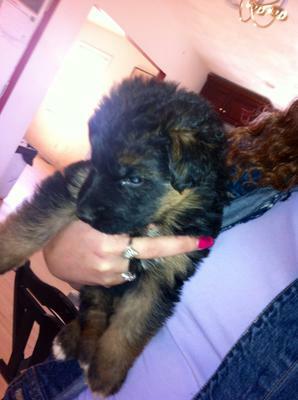 My German Shepherd Puppy Sylar's Homecoming! I was born on Valentines Day this year (2013). I remember the smell of the same girl visiting me once a week when I was in my cushy comfortable bed with my brothers and sisters. She was always picking me up and kissing me making me feel safe in her arms, the same as I felt when I was under my moms fur. The day I turned 8 weeks, I was outside playing with my litter mates, and I stopped suddenly cause I smelled that familiar smell from that girl again. This time she didn't come to me right away but went and talked to my human breeder. I thought that was strange because she always held me for the longest time, even sang to me! All of a sudden she did come to hold me! Then something different happened! She took me away from my pack in a thing they call a truck,(my fur mom told me, she likes to bark at them). I was scared at first but then she held me close to her warm belly and called me Sylar! I now have a name and I felt safe again! I'm 6 months old now but I knew as she drove off that I was coming home to a new family where I would always feel safe and loved! 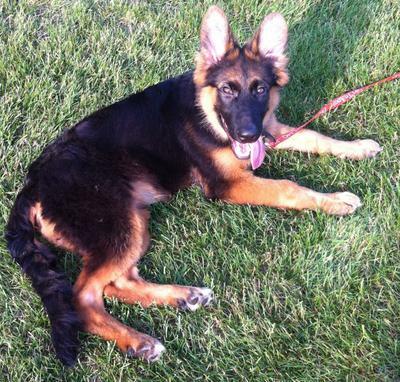 Comments for My German Shepherd Puppy Sylar's Homecoming! He is a handsome pup! The puppy is so precious and enjoy this time with his bonding, training and teaching. German Shepherds are an amazing breed. Take care of Sylar and he will take care of you!